Now that the winter months are behind us, air travel will begin to get busier. As planes are flying fuller than usual, and as a result, people can be grouchier and easier to upset. 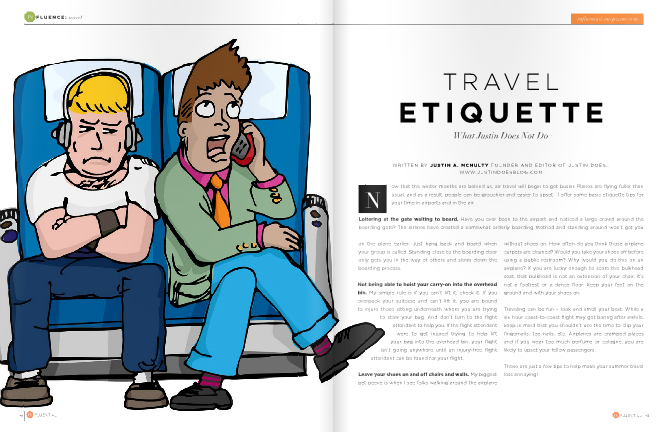 In the latest issue of InFluential Magazine I offer some basic etiquette tips for your time in airports and in the air. Turn to page 22-23 (print) / page 25-26 (digital) to learn more! Did you enjoy this post or learn something new? Please like my Facebook page (fb.com/JustinDoesBlog), follow me on Twitter (@JustinDoesBlog), and follow me on Instagram (@justindoesblog). And please, share with your friends!